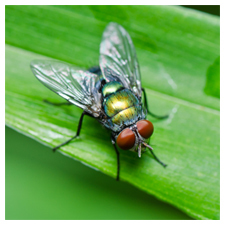 Fly Eliminators are gnat-sized parasitic wasps that feed upon and breed within developing (pupal) stages of manure breeding flies, eliminating the adult pest fly. The adult female fly lays her eggs wherever there is decomposing organic material, while the female Fly Eliminators seek out their target host and deposit their eggs inside the fly pupae. These eggs hatch and begin to grow and feed on the developing fly, thus stopping the adult pest fly from hatching. 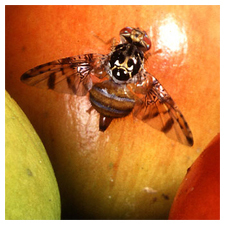 Once mature, the Fly Eliminators emerge from the fly pupae to look for a mate and the females lay more eggs in fly pupaes (see image to the left). 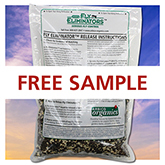 Fly Eliminators reproduce in approximately 3 weeks, constantly replenishing the beneficial insect population. 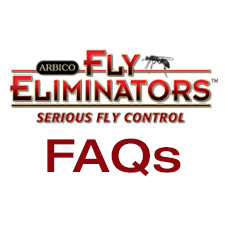 Pest flies reproduce at a faster rate than Fly Eliminators; therefore, they must be reintroduced on a regular basis. 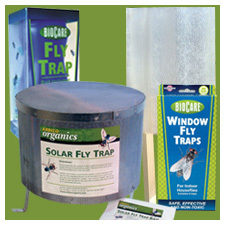 We recommend releasing a shipment of Fly Eliminators every 3 to 4 weeks under a fly control program that lasts throughout the duration of the fly season. Quantity required and frequency of application vary according to severity of the fly problem, neighboring animals, manure management, number of animals, and start date of program. Choose from one of our zone-specific programs below or ARBICO’s experienced staff can tailor a program to fit your particular needs. 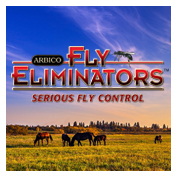 Follow our 4 Steps for Maximum Fly Control to build the most successful fly control program. How to Apply: Fly Eliminators are shipped as parasitized fly pupae in wood shavings. When received, check for evidence of hatching. Once a few have hatched, simply disperse small handfuls or scoops around your property into "hot spot" breeding areas: near manure piles, under water troughs, below bedding, corners of pens and paddocks, and feeding sites. Cover with dirt to protect pupaes. Your Fly Zone is the location where you and your animals live. Your first shipment will be mailed the week indicated by the fly zone you have chosen. 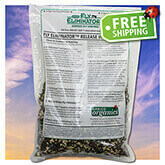 Shipping via US Mail is included in the price of your Fly Eliminators Program. We email or mail a copy of your shipping schedule so you know when your Fly Eliminators are due to arrive. 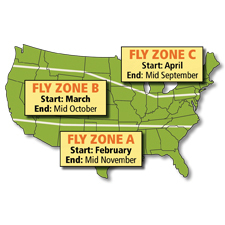 Find Your Fly Zone: You may want to shift up or down a zone depending on your particular elevation and microclimate. Note: Dates shown on the map are our suggested start and end dates. You can start anytime during the fly season. These are units of measurement, not warranties or guarantees of performance. 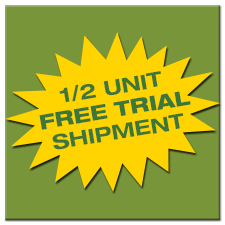 The total seasonal cost of Fly Eliminators™ depends on the recommended number of shipments which may be different than what competitors may recommend. We recommend releasing a shipment every 2-4 weeks throughout the fly season, but releases ranging from 1-6 weeks are not uncommon. Customer experiences may vary. 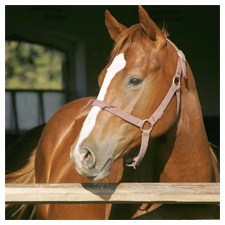 The quantity required and frequency of application can differ according to region, size, condition of property or stables, severity of fly problem, neighbors, manure management, number of animals and start date of program. All warranties, expressed or implied are disclaimed.